A High Court judge has ordered a rethink of the government's nuclear power plans, after a legal challenge by environmental campaigners Greenpeace. A judge ruled that the consultation process before the decision last year had been "misleading", "seriously flawed" and "procedurally unfair". Greenpeace said ministers should "go back to the drawing board". But Tony Blair said while the ruling would change the consultation process, "this won't affect the policy at all". 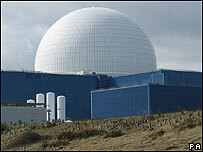 The government will consult again, but still favoured nuclear power being "back on the agenda". "If we don't replace the existing nuclear power stations then, first, I can not see how we are going to meet our climate change targets," he said. "And secondly we will end up as we move as a country from self sufficiency in gas to importing large amounts of foreign gas.... we are going to be dependent on very uncertain supplies of energy and that would be bad for business and bad for the consumer." The government has stressed that the judge's ruling was on the "process of consultation, not the principle of nuclear power". Greenpeace's Emma Gibson told the BBC: "The government's so-called consultation was a sham and we are very pleased the judge has agreed with us on that. "If Tony Blair wants to continue with his misguided plan for a whole new generation of nuclear power stations, the government will have to go back to the drawing board." In 2003, the Energy White Paper described nuclear power as an "unattractive option". It said before any decision was taken to build more stations, there would have to be "the fullest possibly public consultation and the publication of a further white paper setting out our proposals." The government launched a fresh energy review in January 2006, and after public consultation in July published a report, The Energy Challenge, which said "new nuclear power stations would make a significant contribution to meeting our energy policy goals". In court, Greenpeace said the consultation had not fulfilled the promise to carry out "the fullest public consultation". It complained that there had been a failure to present clear proposals and information on key issues, such as disposal of radioactive waste and building costs. The government had argued that the energy review was only part of an ongoing process which would ensure full consultation. But Mr Justice Sullivan said "something has gone clearly and radically wrong". The consultation document had given every appearance of being simply an "issues paper". It had contained no actual proposals and the information given to consultees had been "wholly insufficient for them to make an intelligent response". The judge said information given on waste had been "not merely inadequate but also misleading". Fairness required that consultees should be given a proper opportunity to respond to that substantial amount of new material before any decision was taken. "There could be no proper consultation, let alone the fullest consultation, if the substance of these two issues was not consulted on before a decision was made," said the judge. "There was therefore procedural unfairness and a breach of Greenpeace's legitimate expectation that there would be the fullest consultation before a decision was taken." The judge granted what he called a "quashing order". Shadow trade and industry secretary Alan Duncan said: "This is an astonishing ruling. "What it really says is that the government has been shown up as fundamentally deceitful." Liberal Democrat environment spokesman Chris Huhne said: "The judgement really shows you can't perform a 180-degree U-turn on a matter as important as nuclear power without a proper public debate. "It's a real slap in the face for prime minister's sofa style of government." And Green Party principal speaker Sian Berry said: "Today's historic result shows that the government have got a fight on their hands. "The Energy Review was clearly just a rubber-stamping exercise for a decision the prime minister had already taken." The government says its proposals, including building more nuclear plants, will cut carbon emissions by 19 to 25 million tonnes by 2020, compared with projections based on current trends. Mr Blair announced in January that a white paper would be published next month. It is not yet clear whether the court ruling will lead to a rethink on timing.